Size: 10 x 1.6 x 1.9 in. 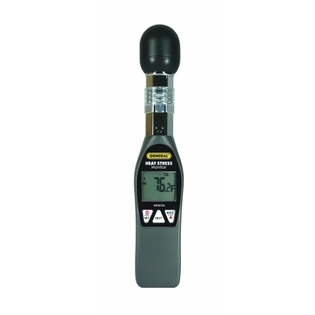 Hand-held Heat Stress Monitor, Model WBGT8758 (35 x 40mm Brass Black Ball). This instrument determines true heat stress temperature by accounting for air currents, relative humidity and solar load in addition to air temperature and relative humidity making this instrument ideal for athletic trainers and the sports medicine environment. The WBGT8758 provides highly accurate readings instantly and weighs less than 4.5 oz. Larger Bulb Globe Size Available: See also the related model WBGT8758 (35 x 40mm Brass Black Ball version) for greater black ball surface area.